Since I have ventured into the world of cooking I have discovered that even if your ingredients or protein are of lower quality if you have solid spices, most items can be recovered. The one item that we tend to use a lot of is Extra Virgin Olive Oil. It is important to monitor the heat and light that the oil receives, as these two elements will destroy the oil. Since this is a consideration while cooking, I have been practicing my heat application. With the coming holidays upon us, Garlic Gold has offered a Garlic Gold Gift Box to one lucky reader! This entry was posted in Food and Drink Products, Giveaways and tagged dinner, giveaway, giveaways, Gluten free, Holidays 2016 Gift Ideas, Organic food, product review, sauce, spices on November 16, 2016 by Jennifer. I am not the same chef I once was, and that is a good thing.When Jason and I began our cooking adventure together, I could do little more than fry a simple chicken. As I learn more about cooking the more I realize it is a combination of the right seasoning and the right application of heat. There are a couple of things I enjoy using in almost all my dishes is some form including olive oil and spices/salts. Back in October of 2015 I had the opportunity to review Garlic Gold’s olive oils. 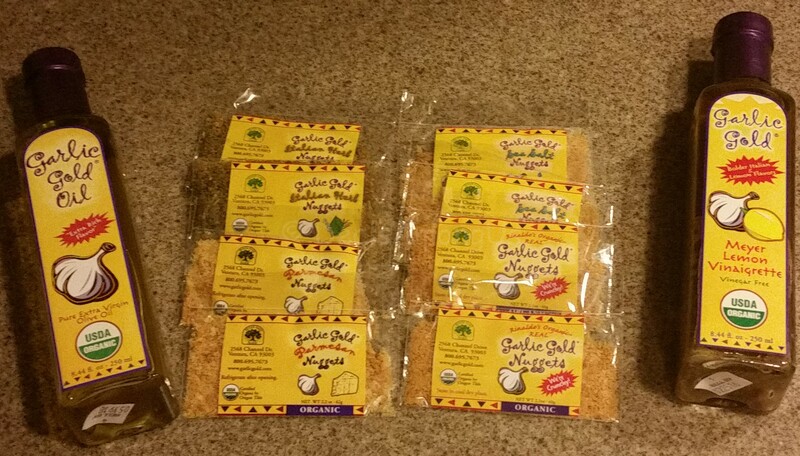 Since I have moved onto the the seasoning of my food I felt a good time to review their Garlic Gold Nuggets Gift Box. This entry was posted in Food and Drink Products, Giveaways, Gluten-Free, Reviews and tagged dinner, giveaway, giveaways, Gluten free, Organic food, product review, sauce, spices on July 30, 2016 by Jennifer. There is no denying it, SUMMER IS HERE!!! Summer was always a special time for me since I am a summer baby. I was born smack dab in the middle of summer and as so, I would have BBQ parties. The BBQ always played a role in my birthdays due to the ease, flavor and the versatility! Since I am still a fan of the BBQ, and smothering whatever I am cooking in sauce I am THRILLED to offer you a Sauce Goddess Giveaway!! This entry was posted in Food and Drink Products, Giveaways, Gluten-Free and tagged giveaways, reviewsdone, sauce on June 16, 2016 by Jennifer. The holidays are approaching and this is the time of year for company coming for meals, pot luck meals and traditions. I have mentioned in past reviews about Jason and his Italian heritage. I hear stories of holiday of his youth that include many meals, and many variations of pasta with sauce. Since Jason remembers these meals so fondly, he is very specific in his wishes for sauces. The ideal sauce for our house is made of all natural ingredients such as his Grandma made – he watched the ingredients go into the sauce, ensuring the freshness at a young age. The other quality of an ideal sauce is few ingredients, so that the flavors become distinct and individual. When Jason was young his Grandmother would quiz him on what was in the sauces – he usually guessed in the 90% range. As an adult he has searched for a similar sauce, since the experience is one in a million in one lifetime, the sauce is the settler. As a review blogger we get opportunities to sample different items, and sometimes those items include pasta sauce. 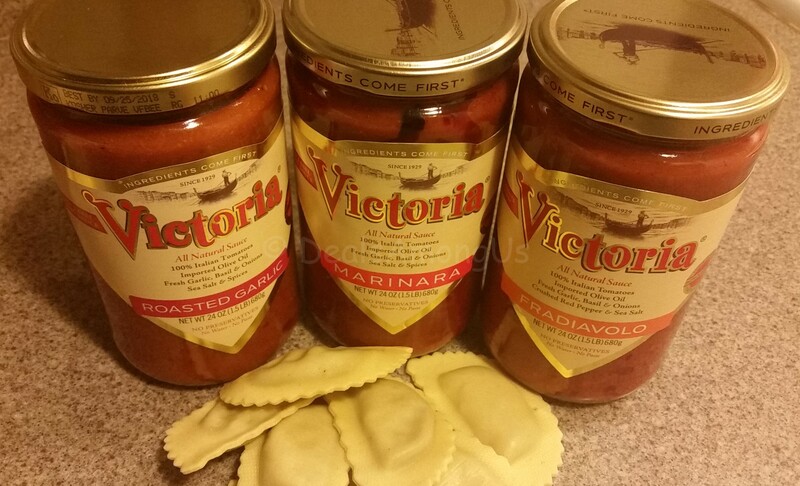 This was the case a couple of weeks ago when we had the opportunity to sample Victoria Foods Pasta Sauce. This entry was posted in Food and Drink Products, Giveaways, Reviews and tagged giveaway, pasta sauce, sauce on December 19, 2015 by Jennifer. Introductions and cooking are remarkably similar, and both can be challenging. When a person embarks on learning to cook the introduction to the oils is inevitable. After a while a comfortably sets in and a distinction in flavor becomes noticeable – that is where the introduction of flavored olive oils is made. I recently made an introduction of my own to Garlic Gold. Garlic Gold’s beginnings were unlike most companies, but completely unique. Garlic Gold began as a high school economics project by Rinaldo Brutoco for his son Orion. The students created a business plan around Rinaldo’s garlic recipe with crunchy toasted garlic nuggets included. The students packaged, labeled and sold the project at the local farmer’s market. This entry was posted in Food and Drink Products, Giveaways, Reviews and tagged dinner, Gluten free, Organic food, product review, sauce, spices on October 25, 2015 by Jennifer. Seponifiq Bread and Lettuce Sepo Sauce Fall Giveaway!!!! Back in June I reviewed Seponifiq’s Bread and Lettuce Sepo Sauce and at the time I had the opportunity to give away a prize pack and I am happy to announce that we are once again giving away a gift basket courtesy of Seponifiq Bread and Lettuce Sauce. 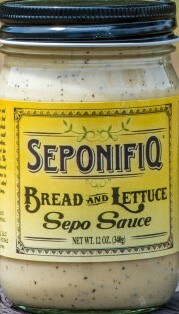 What is Seponifiq Bread and Lettuce Sepo Sauce you may wonder? It is a marinade, a sandwich spread, a dip for your vegetables, a salad dressing and a pasta mix in. The sauce has a slight garlic note in the background with a hint of horseradish. Also, this is a Gluten-free item that does make you feel like you are eating gluten-free. Click here for recipe ideas. Enter below to win a fall themed gift basket to include at least 2 jars of Seponifiq’s Bread and Lettuce Sepo Sauce, as well as items such as coffee, candles and fall themed decor and you can enter below and GOOD LUCK!!!! This entry was posted in Food and Drink Products, Giveaways, Gluten-Free and tagged Gluten free, sauce, Sepo Sauce on September 6, 2015 by Jennifer. The one thing I have learned is that you can not stop time. Time marches on no matter what we do and how we wish for things to be slower. I heard once that it is called “the quickening” and the longer time goes I think that is the perfect word for the way life passes by. With the march of time comes the passing of months and the quick arrival of a big day in my life, With each day that passes, I reconsider my food choices and the potential benefits of my new choices. There is something special about knowing that somebody is curating a box with health consciousness in mind. Send Me Gluten Free’s monthly box is doing just that for the Gluten-Free community. Each month Send Me Gluten Free (SMGF) chooses 8-12 full size items to include in their monthly box, which allow for greater sampling of the available offerings for those with gluten sensitivity. They were generous enough to send me the April box to sample and review and included in the box were the following products. 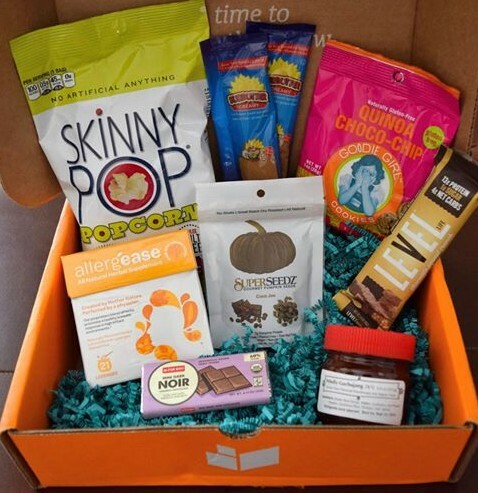 This entry was posted in Giveaways, Monthly Subscription Boxes, Reviews and tagged cookies, Coupons, giveaways, Gluten free, monthly subscription box, popcorn, sauce, snacks on April 18, 2015 by Jennifer.